Globally, as of June 2017, 35 countries banned the retail sale of electronic nicotine delivery systems (ENDS), while 44 countries regulated these products. To understand what type of tobacco control regulatory frameworks are associated with adopting bans, we test whether countries with higher levels of tobacco control policy development are more likely to ban ENDS retail sales. A dataset on the policy choices of 79 countries who have adopted formal policies regulating ENDS products was combined with data from the WHO 2015 Global Tobacco Control Report to create a weighted index of tobacco control policy development in a modified version of Joosen and Raw's Tobacco Control Scale (TCS) (2006). Logistic regression analysis on the final cross-sectional dataset was performed to test the hypothesis that countries with greater levels of overall tobacco control policy development and on subscales corresponding to the MPOWER letters were more likely to ban than regulate retail sales of ENDS. 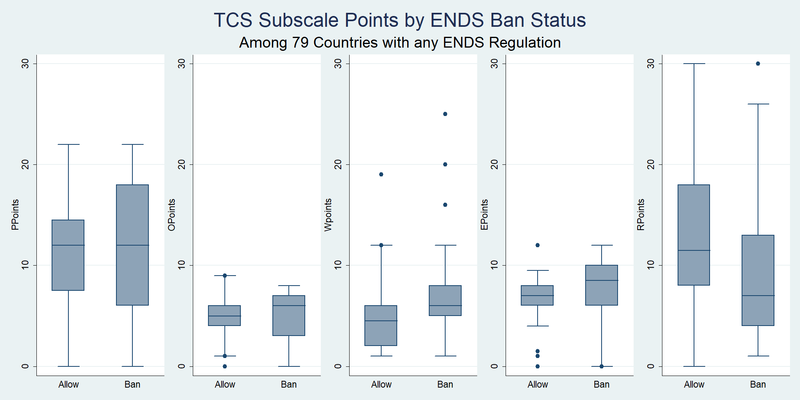 Countries with higher TCS scores were not more likely to adopt bans on retail sales of ENDS (β=-0.0004, p=0.977) compared to countries with lower scores. Particularly, countries with higher scores on the subscales of warning users of the dangers of tobacco smoke were more likely to ban ENDS retail sales (β=0.251, p=0.002) while countries with higher scores on tobacco tax policy were more likely to allow retail sales of ENDS (β=0.140, p=0.003). The likelihood of a country banning retail sales of ENDS has a complex association with tobacco control policy development, varying on important subscales in direction. The role of the European Union's Tobacco Product Directive appears to have played an outsized role in creating observed patterns, necessitating study of how this will play out going forward.